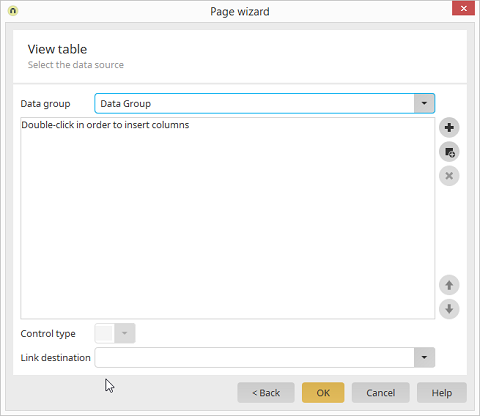 Applications module Page wizard / Click on "Next" Select Data list / Continue to Data list dialog Select Table / Click on "Next"
Select the data group whose data should be shown. Opens a dialog where a new data field can be created. The data field will automatically be added to the table as a column. Opens a dialog where existing data fields can be added as table columns. Select the desired control type of the currently selected table column. Select the page that should be loaded when a user clicks on a record in the table.